I am very pleased to be part of EOJ in Slovakia. Since I have discovered the beauty of agility I have enjoyed agility from every angle - as a fan, as a trainee, as a competitor, as a trainer as well as a judge. I am part of the Slovak National team for several years. I can utilize all my experiences now. So I believe that all juniors will take many positive experiences from Slovakia. I can utilize all my experiences now. So I believe that all juniors will take many positive experiences from Slovakia. EOJ is competition so surely everyone would like to achieve the best results. But let's not forget the main idea of EOJ - EOJ is celebration of our youth and great opportunity for new friendships and new experiences. I have been doing agility as competitor since I was seven years old. I have been part of Slovak National team on World Championship and European Open since 2004. 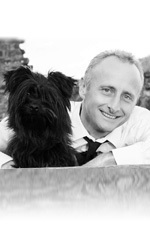 Currently I am competing with young border collie and patterdale terrier on national as well as international competitions. 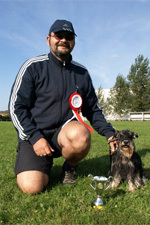 I became agility judge in 2012 and since then I am competing as well as judging agility. I wish all juniors good luck in representation of their countries on EOJ 2016 and I am looking forward to meeting you on course. From the first time I had seen a dog running the agility course it was decided then this wonderful kind of dog sport becomes one of the most important parts of my life. As I am not an active competitor anymore, I am fully devoted to agility judging and to the work of agility trainer and instructor. Being an international judge (since 2007) I feel as a great honor I was elected by the FCI agility committee to judge European Open Junior 2016. I am looking forward so much to this competition and the top performance of the best young handlers from all over the world and their dogs. I wish good luck to all of them and also to the group of the Slovak organizers. 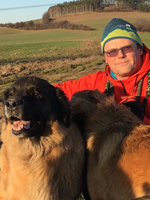 I am sure they have prepared for us a wonderful event and we all will have great three days full of agility in Slovakia. 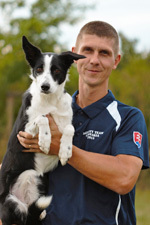 As part of the international Agility family I already participated several times to the European Open for Juniors. I followed the events as Agility fan but also as a parent. And as parent I have to say that the JEO is a great thing. With this event we teach our children that on one hand you have competition but on the other hand it is great to have friends with a same passion all over the world. And the children of today are the future of tomorrow. I’m happy that the FCI committee gave me the possibility to immerge this unique spirit of a JEO as judge, what enables me to help to make the JEO in Slovakia an unforgettable event. My name is Pavol Rohácek and I have been doing agility since 2007. From the beginning I had the opportunity to develop myself under the wings of amazing trainers who kept me doing this incredible sport. 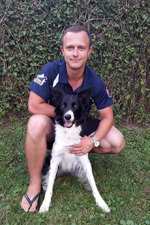 My first agility dog was a border collie Maike. He loved this sport so much and because he was too crazy on the parkour I had a difficulty of controlling him. 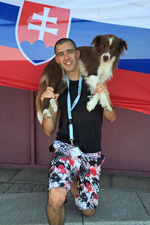 With my second dog Casey I had the opportunity to be part of the Slovak National Team at the EO 2014 and IMCA 2015 where I have gained many experiences. In the past years I have become an agility judge, coach of my own agility club and organiser of agility competitions but most of my energy goes to junior agility development because I consider them as a future of agility. That is why I am so happy to accept the function of a assistant judge of EOJ 2016. I wish good luck to all junior competitors. It is a great opportunity for them to gain valuable experiences and may the best win!